While I'm Waiting...: Waiting on...this Halloween candy to disappear!!! Waiting on...this Halloween candy to disappear!!! OK - I have no willpower! My mouth started to water just by looking at this picture! And, just in case you are like me, I'm going to help you out! After spending a few days looking at all this candy (and maybe having a bite or two of some delicious chocolates! 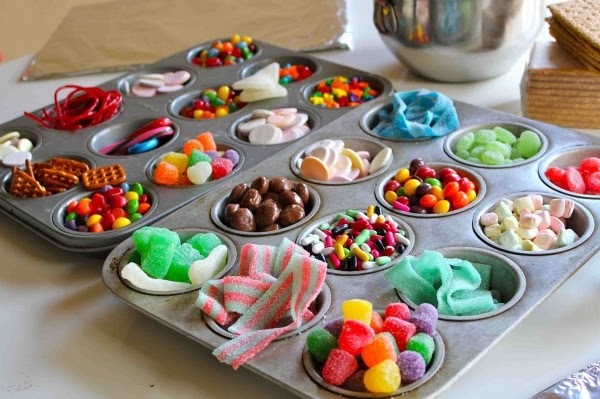 ), I found a great link that listed many ideas of what we can do with all this candy instead of just eating tossing it. Normally, I let the kiddos go through and pic out some favorites (after I've hid all the Reese's - ugh - I know! I'm terrible!) and then we either take it to their dentist who will buy it back for $1/pound (you can check this website for the nearest participating dentist in your area) or send it with their dad to his office. I just need it GONE! But, after doing a little research, I've come across some new ideas! 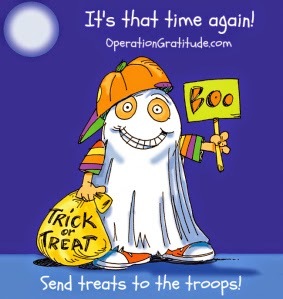 *Gather your candy by November 15th and send it to our troops! You can find out more information here. And, if you are participating in the #30daysofThanksandGiving, consider having your kiddos include a letter to the soldiers thanking them for fighting for our freedoms! *Craft! Have a daughter who loves to create? 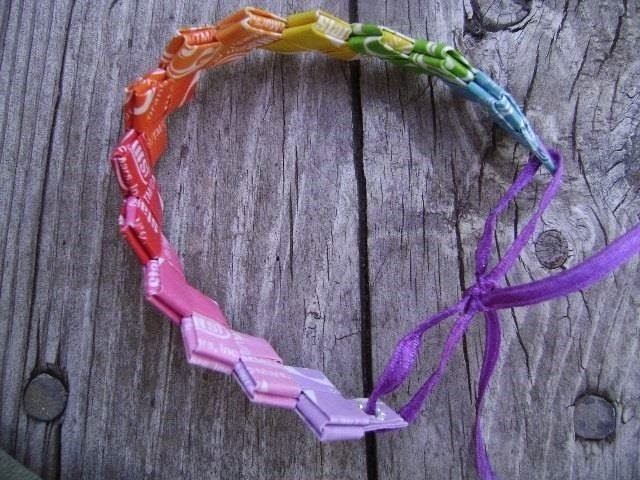 Check out these amazing ideas of what you can do with candy wrappers! *Do an intentional act of kindness - Make little bags of candy and leave for your mail carrier, UPS delivery person, trash collector, etc. We are going to make a little bag of goodies for the custodian at Holden's school. I felt so bad on Friday when we left after all those Halloween parties! I'm sure that's not how he wanted to spend his Friday afternoon! 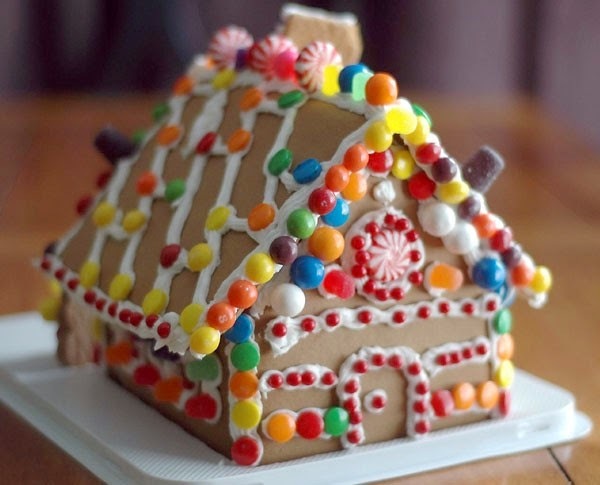 *Use on gingerbread houses - There are all kinds of fun candies that would be perfect on a gingerbread house! *Drop off candy at your local women's and children's shelter. Everyone enjoys a little treat now and then and this would be a simple way to bless someone else. A huge thank you to Michelle at Sunshine & Hurricanes for her great list of ideas! 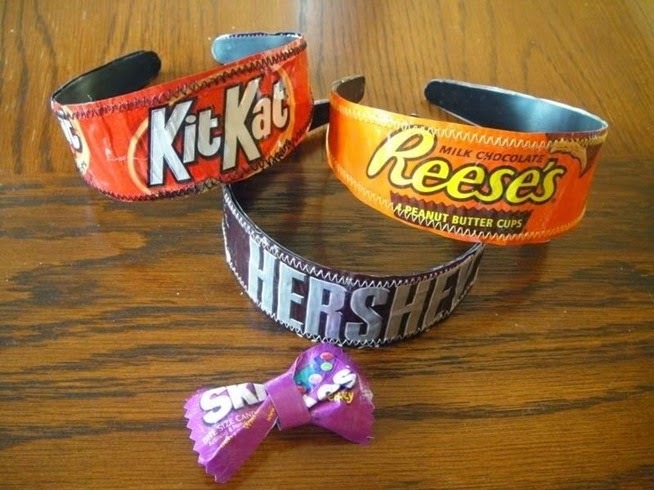 Check out their site for even more ideas of what to do with your Halloween candy. I hope you are having a great week! Don't wait...get out there and bless someone with candy! Thanks, Chrissi! I always have a hard time throwing stuff away that I think someone else could use - I love finding ways of giving something one more life instead of tossing it. I've got a box by our front door that I toss stuff in till I can find a need for it. Thanks for stopping by! Have a fabulous day! All super ideas! I heard somewhere about sending the candy to veterans and thought it was the perfect pairing to be thankful for our country and give to those serving! Thanks, friend! And, if you take it to our dentist - they pay you AND send it to the troops! You can use the few dollars you make to bless someone else and thank the troops - it's a two-for-one! Oh my word, I have NO self control when it comes to Halloween candy! I think I ate most of my kids bucket full! I wanted to invite you to join in on our Thankful List link up again. I loved reading your post! The link up will be live tomorrow morning. I hope you join in! Thanks, Angela! We dropped off (most!) of the candy yesterday at the dentist office. Kiddos got $4 for their loot - they were thrilled (and so was I!). Thanks for the reminder about the link-up. I posted in a comment on your blog - just not sure I did it correctly. Let me know if I need to do something differently. Thanks for stopping by! Have a great day!